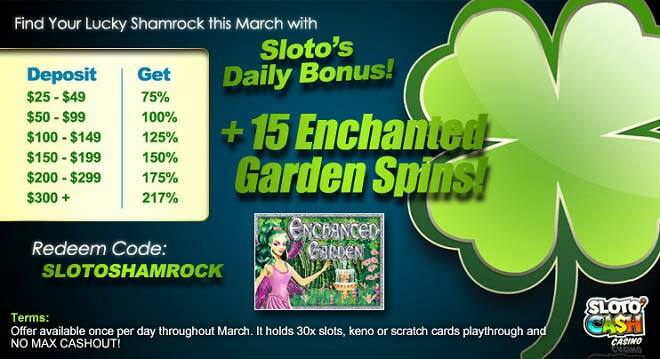 It's the perfect time to check if you have the luck of the Irish this March when you play Enchanted Garden and claim up to 217% Match + 15 Free Spins for extra good fortune! Deposit as little as $25 to collect your Lucky Shamrock Bonus and you'll quickly find a lot more than just a pot of gold at the end of the rainbow! + 15 Enchanted Garden Spins! Experience the good luck of the Irish each and every day of March and enjoy our daily Match + 15 Free Spins on your next deposit!